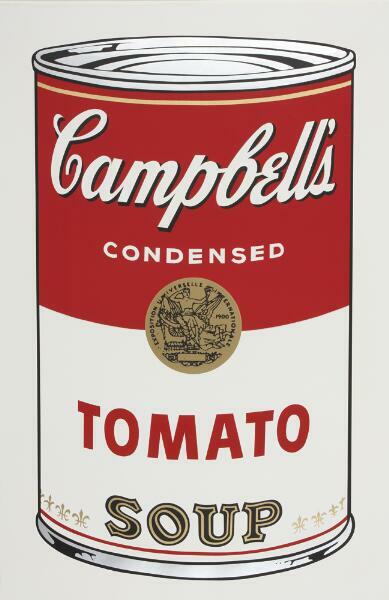 The first Campbell’s Soup Can paintings were shown at Ferus Gallery in Los Angeles in 1962. The exhibition of 32 paintings met with such ridicule and derision that a neighboring gallery put actual soup cans in its window and labeled them “the real thing,” sold for twenty-nine cents. The original Soup Can paintings were meant to depict objects so common and everyday that no one would even notice them, but what Warhol ended up making were infamous images with which he would become synonymous. The banality of hundreds of soup cans on a grocer’s shelf is magnified in these silkscreens, which are blown up larger than life. Silver and gold metallic inks embellish the straight-on portrayals of popular flavors, such as Pepper Pot, Black Bean and Tomato. The images’ clean, crisp lines are indicative of the silkscreen method, and the use of this mass-reproduction process parallels the mass marketing, production and consumption of the food items themselves. Image reproduction permission may be granted for scholarly or arts related commercial use. All image requests, regardless of their intended purpose, should be submitted via email. Requests can also be made by fax or mail. Images may be protected by copyright and other intellectual property rights. Additional permission may be required. Approved requests for the reproduction of an image will receive a contract detailing all fees and conditions of use of the image. Upon receipt of both the signed contract and full payment, the Office of Rights and Reproductions will provide the image. A complimentary copy of the published material must be provided to the Norton Simon Museum. Please fill out our Online Reproduction Request Form.